Two of Ziger/Snead’s current projects have been awarded Sustainable Communities Tax Credits, administered by the Maryland Historical Trust. The Maryland Film Festival Parkway Theater has received $2 million in credits, and the Bromo Seltzer Tower has been granted $500,000. $10 million in state tax credits was distributed between ten historic renovation projects across Maryland. Five of the projects selected are in Baltimore City. The Sustainable Communities Tax Credit program is committed to preserving the historic buildings and structures which have shaped the identity of Maryland downtowns, while funding sustainable growth. From its foundation in 1996, the program has invested close to $350 million in over 3,800 residential and 600 commercial historic sites. In the recent press conference hosted by the Maryland Department of Planning, Secretary Richard E. Hall gave mention of this motivator. "By transforming vacant or under-used buildings, the tax credit program represents an investment in our downtowns,” he said. “By being in neighborhoods with water and sewer, roads, curbs and gutters, utilities and other public services, these projects give us an opportunity for smart growth rather than encouraging new construction beyond the edge of town requiring new infrastructure paid for by the public." The Parkway Theater, originally built around 1915, operated into the 1980’s. The theater is the latest in redevelopment projects located in Baltimore’s North Avenue corridor, central to the Station North Arts District. Ziger/Snead is partnering with Seawall Development and the Maryland Film Festival (MFF) to rehabilitate the theatre into a vibrant cultural center as it once was. 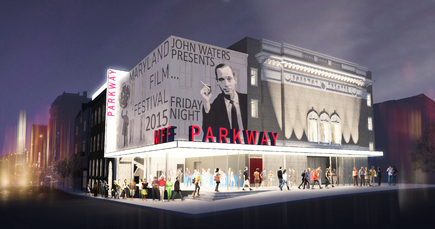 Renovation and restoration to the historic Parkway Theater and adjacent buildings will house a year-round film, digital-video, and live-music center for the Maryland Film Festival. The design will respect the historic integrity of the building while at the same time boldly communicate the transformation of the district into a distinct hub for the convergence of film and music. The project will transform the Parkway’s original auditorium into a beautifully restored 419-seat film and music space, and add two smaller theaters seating 86 and 99 patrons. The 29,000 sf renovation will also include offices, small screening and seminar rooms, and a restaurant. The theater will provide a permanent location for the Maryland Film Festival, and also serve as a venue for Johns Hopkins University and the Maryland Institute College of Art’s film programs. The Bromo-Seltzer Tower, constructed in 1911, was the tallest building in Baltimore until the 1930’s at 15 stories high. The clock tower, which was once crowned with a giant revolving Bromo-Seltzer Bottle, is all that remains of the Emerson Drug Company factory which was demolished in 1967. Ziger/Snead is leading the exterior renovation for the Baltimore landmark. More information can be found on the Maryland Historical Trust website and on the Maryland Department of Planning.